Hi….I wanted to make sure to tell you upfront that I have received no product or compensation to promote this website. I do so because they offer excellent information concerning topics important to dog owners. This week on Barking Wednesday I want to share a website that offers very helpful info about raising a dog. I have asked my friends what is the one topic that they want more info about when it comes to their dog. They all told me training is their biggest concern. Kingers is a Therapy Dog. When I worked in healthcare he came to work with me everyday. It is amazing what a wagging tail can do to improve a sick persons mood. Hours of training allowed King to give back so much. While checking out some treats to buy for King I came across Loving Pets Training and Behavior Tip of the Month. 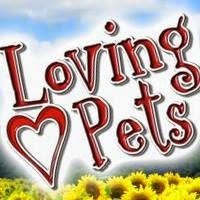 Each month Loving Pets offers a new training tip. Plus, they have a archive of all past post! Which makes it great for new visitors to the site. This month's Training Tip is Raising a Good and Socialized Dog Citizen. Check out the great info from past months! CLICK HERE for links to the following topics. How do I stop aggression towards other dogs? How do I prevent my dog from chewing everything? How can I cure my dog from separation anxiety? How can I stop my dog from pooping in the house? How can I stop my dog from pulling on the leash? Use this website as a resource for helping to train your dog. If your dog is trained but has a area that he needs a little help on - check out the page for his needs. I always like to have numerous forms of material to help me do what is best for Kingers. What works for one dog just might not be what works for others. Using various sites to help guide me to improving Kings behavior I feel is the best solution.